Brittney Thomas-Ljungberg has regained her sight after her eye was split open in a random attack. 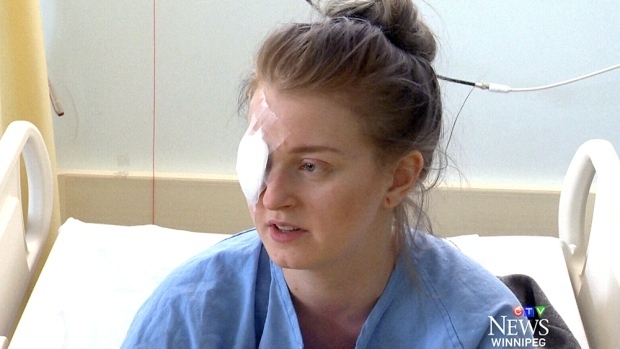 A university student has regained her vision after her right eye was split open in a random attack in the Winnipeg. In June, Brittney Thomas-Ljungberg was sucker-punched in the eye in an attack in the Exchange District. “I first saw Brittney a few days after her injury,” said Dr. Frank Stockl, a surgical retinal specialist, in a release. In July, Thomas-Ljungberg's retina detached and she had to have an emergency surgery to remove her eye's lens and repair the retina. In October, she received a lens implant and now her vision is stable with 20/25 vision. “I wasn’t sure I’d be able to see again,” said Thomas-Ljungberg. “I’m forever grateful to Dr. Stockl and his crew.” Thomas-Ljungberg and Stockl will be speaking to the media today at 11:30 a.m. at the Ophthalmology Assessment Unit.